PCI fractional flow reserve. Secondary end points included procedural complications and type 4a periprocedural myocardial infarction. Safety was assessed by the rate of acute kidney injury. RESULTS: OCT use led to a change in procedural strategy in 50% of the patients in the OCT-guided group. The primary end point was improved in the OCT-guided group, with a significantly higher fractional flow reserve value (0.94±0.04 versus 0.92±0.05, P=0.005) compared with the angiography- guided group. There was no significant difference in the rate of type 4a myocardial infarction (33% in the OCT-group versus 40% in the angiography- guided group, P=0.28). The rates of procedural complications (5.8%) and acute kidney injury (1.6%) were identical in each group despite longer procedure time and use of more contrast medium in the OCT-guided group. Post-PCI OCT revealed stent underexpansion in 42% of patients, stent malapposition in 32%, incomplete lesion coverage in 20%, and edge dissection in 37.5%. This led to the more frequent use of poststent overdilation in the OCT-guided group versus the angiography-guided group (43% versus 12.5%, P<0.0001) with lower residual stenosis (7.0±4.3% versus 8.7±6.3%, P=0.01). CONCLUSIONS: In patients with non–ST-segment elevation acute coronary syndromes, OCT-guided PCI is associated with higher postprocedure fractional flow reserve than PCI guided by angiography alone. OCT did not increase periprocedural complications, type 4a myocardial infarction, or acute kidney injury. CLINICAL TRIAL REGISTRATION: http://www.clinicaltrials.gov. Unique identifier: NCT01743274. • In this first randomized, controlled trial testing optical coherence tomography (OCT) guidance during PCI in patients with non–ST-segment elevation acute coronary syndromes, OCT findings directly affected physician decision-making, leading to a change in procedural strategy in half the cases in the OCT- guided group. • OCT-guided PCI modestly improved functional outcome compared with PCI guided by fluoroscopy alone, as assessed by fractional flow reserve mea- sured at the end of the procedure. • This improvement seemed to be explained mostly by optimization of stent expansion. • The benefit was obtained at the cost of a longer procedure with higher fluoroscopy time and more contrast use, but without an increase in periprocedural myocardial infarction or kidney dysfunction. • The findings of the DOCTORS (Does Optical Coherence Tomography Optimize Results of Stenting) study add to the accumulating body of evidence supporting a potential benefit of OCT to guide PCI. • These results suggest that there may be a role for OCT as a complement to fluoroscopy for the guidance of PCI procedures in non–ST-segment elevation acute coronary syndromes. • Additional prospective studies with clinical end points are required before considering incorporating OCT guidance for standard use in patients with non–ST- segment elevation acute coronary syndromes. The additional information yielded by OCT imaging during PCI affects physician decision-making in two thirds of the cases.6 Nonetheless, it remains to be investigated whether the use of additional interventions prompted by OCT findings will translate into a benefit in procedural outcome. In this setting, randomized data investigating the utility of OCT compared with angiography alone to guide PCI are lacking,7,8 specifically in patients with non–ST-segment elevation acute coronary syndromes (NSTE-ACS). 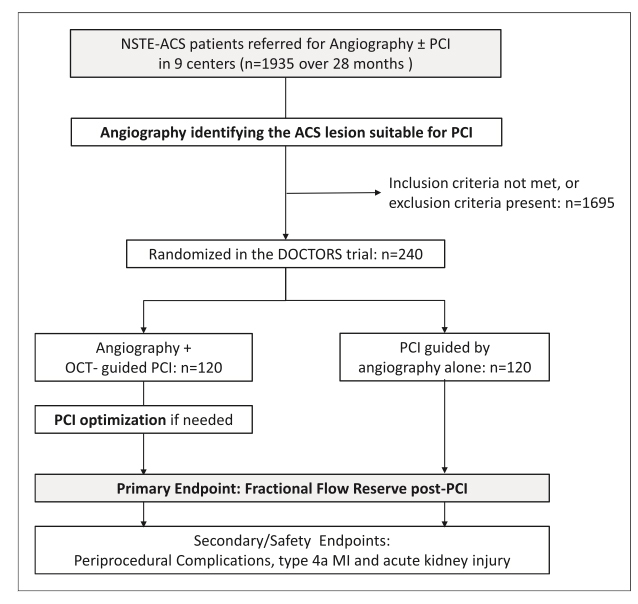 Therefore, we aimed to evaluate whether the use of OCT during PCI would provide useful clinical information beyond that obtained by angiography alone, and whether this information would modify physician decision-making, thus affecting the functional result of angioplasty as assessed by fractional flow reserve (FFR) measured after stent implantation in a lesion responsible for NSTE-ACS. The DOCTORS (Does Optical Coherence Tomography Optimize Results of Stenting) study was a multicenter, prospective, ran- domized trial conducted in 9 university teaching hospitals and general (non-academic) hospitals in France. The details of the study design have previously been published elsewhere.9 The study protocol was approved by the Institutional Review Board of the University Hospital of Besancon, France, and all participants provided written informed consent. The study is registered on ClinicalTrials.gov under the identifier NCT01743274. (ii) elevation (>upper limit of normal, ULN) of cardiac enzymes (CK-MB, troponin I or T); and presenting an indication for coronary angioplasty with stent implantation of the target lesion (single lesion on the culprit artery without diffuse disease on the same vessel) considered to be responsible for the ACS. Exclusion criteria were: Left main disease; in-stent restenosis; presence of coronary artery bypass grafts; cardiogenic shock or severe hemodynamic instability; severely calcified or tortuous arteries; persistent ST-segment elevation; 1 or more other lesions considered angiographically significant, or nonsignificant diffuse disease, located on the target vessel; severe renal insufficiency (estimated glomerular filtration rate (eGFR) ≤30 mL/min); bacteremia or septicemia; severe coagulation disorders; pregnancy; refusal to sign the informed consent form. The primary end point was FFR measured at the end of the procedure. 1) Procedural complications defined as occurrence of any one or more of the following: Presence of no reflow, coronary perforation, occlusive dissection, spasm, or stent occlusion. 2) Periprocedural (type 4a) myocardial infarction (MI) as defined by the Third Universal Definition of Myocardial Infarction.10 3) Identification of a threshold value for quantitative OCT findings that best predicts an FFR value >0.90. 2) Duration of the procedure, fluoroscopy time, quantity of contrast media used, and radiation dose delivered. Patients were randomly allocated to 1 of the 2 groups after initial coronary angiography, once the operator had identified the lesion responsible for the ACS, with randomization stratified by center. Randomization was performed using consecutive sealed opaque envelopes containing the treatment arm allo- cated to the patient. The attribution schedule was generated randomly by computer in blocks of 20. In the angiography-guided group, the angioplasty procedure was guided by traditional fluoroscopy alone, performed before and after stent implantation according to standard of care. Before PCI: quantitative measure of the reference diameter and reference area of the vessel and the length of the lesion; presence and extent of thrombus; presence and extent of calcification. 2. After PCI with stent implantation: quantitative measure of in-stent minimal lumen diameter and in-stent minimal lumen area, reference lumen diameter and reference lumen area, presence of thrombus, presence of edge dissection above or below the stent, protrusion of tissue through the stent struts, optimal lesion coverage, malapposition of the stent struts to the vessel wall, sub- optimal stent expansion. 1. The length and diameter of the stent to be implanted were to be chosen based on the quantitative measures of reference vessel diameter and lesion length by OCT.
2. Additional balloon overdilations were to be performed in case of stent underexpansion. Stent underexpansion was deemed to be present when the ratio of in-stent minimal lumen area to reference lumen area was ≤80%. Management of malapposition was at the operator’s discretion. 3. Additional stent implantation(s) were to be performed to rectify incomplete lesion coverage. Conversely, management of edge dissection was at the operator’s discretion. 4. Use of GP IIb/IIIa inhibitors and aspiration thrombectomy were to be considered systematically if thrombus was present. 5. Rotational atherectomy was to be considered in case of circumferential calcifications. The operator was required to take these parameters into account in deciding on subsequent strategy for the rest of the procedure in order to optimize the final angiographic result. In both groups, FFR was measured at the end of the procedure, once the operator considered the result of the angioplasty to be optimal. FFR was measured using a pressure wire (St. Jude Medical, Saint Paul, MN) equipped with a pressure sensor located 30 mm from the distal end of the catheter. The wire was introduced above the lesion responsible for the ACS symptoms, and the FFR was calculated as the ratio between average distal pressure and the average aortic pressure recorded during maximal hyperemia induced by injection of an intracoronary bolus of 150 μg of adenosine, followed by a flush of iso- tonic saline of 10 mL. The average of three consecutive FFR measures was recorded. The procedure was then considered to be finished, and no further interventions were undertaken, regardless of the FFR value obtained at this final measure. OCT images were acquired using the FD-OCT Optis system (Lightlab Imaging Incorporated, Westford, MA) and 6F guide catheter compatible Dragonfly Duo and Dragonfly Optis catheter (Lightlab Imaging Incorporated, Westford, MA). The catheter was introduced into the coronary artery via a standard 0.014-inch angioplasty wire, after prior injection of an intracoronary bolus of nitroglycerin. To remove all blood adequately from the imaging site, nonocclusive flushing was performed using continuously injected contrast medium via an automated power injector, and the OCT catheter was pulled back at a speed of 18 mm/second to guarantee sufficient time to acquire images of a 54 mm long segment (frame density: 10 frames/mm). OCT images were analyzed online and offline using Lightlab software. All OCT images were analyzed in a centralized core laboratory (University Hospital of Besancon) by 2 independent operators (N.M., N.B.) blinded to the angiographic findings, procedural strategy, and final FFR value. Discordant OCT analyses were resolved by consensus. The values retained for final analysis were those resulting from central core laboratory analysis. OCT criteria for the definition of the end points were defined according to recent consensus documents and established definitions.12–14 The main definitions are given in Section I in the online-only Data Supplement, as well as representative images of tissue prolapse, stent malapposition, stent under- expansion and edge dissection (Figure I in the online-only Data Supplement ). All angiograms were analyzed at the core laboratory in the coordinating center (University Hospital Besancon, France) using an automated edge detection algorithm (QAngio XA 7.3, Medis Medical Imaging Systems BV, Leiden, Netherlands). The measurements were performed for each pair of orthogonal views and averaged. All patients were followed up for 6 months to record adverse events, defined as the occurrence of any one or more of the following: death, recurrent MI, stent thrombosis defined according to the ARC definition,15 or repeat revascularization of the target lesion. Data management and analysis was performed centrally at the Cardiology Department of the coordinating center (University Hospital of Besancon, France), where a dedicated team of data managers were responsible for data collection and monitoring. Formal data monitoring was overseen by the Clinical Research Management Department (Délégation à la Recherche Clinique et à l’Innovation) of the coordinating center by sending independent monitors to each site regularly to monitor files and check data entry. Quantitative variables are expressed as mean±standard deviation for normally distributed variables, and median (interquartiles) for non-normally distributed variables. Normality of continuous vari- ables was verified using the Kolmogorov-Smirnov test. Categorical variables are described as number (percentage). Quantitative data were compared using the Student t or Mann-Whitney tests, and qualitative variables using the χ2 or Fisher exact tests, as appropriate. The paired Student t test was used for within-patient comparisons of continuous variables. To compare the perfor- mance of quantitative OCT parameters to predict an FFR value >0.90, receiver operating characteristic curves were constructed and the area under the curve was compared using the Delong method.16 The Youden index was used to identify the optimal cut- off values from receiver operating characteristic curves. A P value of <0.05 was considered statistically significant. All analyses were performed using SAS version 9.4 (SAS Institute Inc., Cary, NC). The flow chart and study design are presented in Figure 1. Between September 12, 2013, and December 31, 2015, among 1935 patients with NSTE-ACS referred for PCI in 9 centers, a total of 240 patients were included (120 in the angiography-guided group and 120 in the OCT-guided group). There were no crossovers between groups. 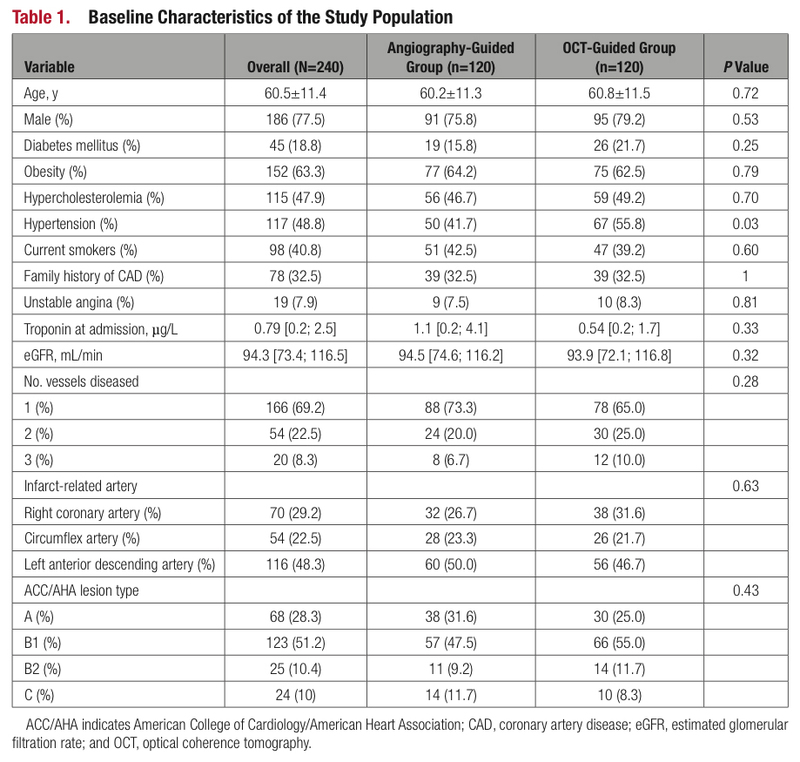 There were no significant differences between groups in the baseline characteristics, which are presented in Table 1. The majority of NSTE-ACS patients were non–ST-elevation MI patients (92.1%), and only 19 patients (7.9%) had unstable angina without troponin elevation. The majority (69.2%) had single-vessel disease, and the left anterior descending artery was most frequently responsible for symptoms. Figure 1. Flowchart of the study population and design. ACS indicates acute coronary syndrome; DOCTORS trial, Does Optical Coherence Tomography Optimize Results of Stenting trial; MI, myocardial infarction; NSTE-ACS, non–ST- segment elevation acute coronary syndromes; OCT, optical coherence tomography; and PCI, percutaneous coronary intervention. The primary end point was improved in the OCT-guided group, with significantly greater FFR value compared with the angiography-guided group (0.94±0.04 versus 0.92±0.05, P=0.005; Figure 2A). Similarly, the number of patients with FFR>0.90 at the end of the procedure was significantly higher in the OCT-guided group compared with the angiography-guided group (99 [82.5%] versus 77 [64.2%], P=0.0001). Categorization of the patients by quartiles of FFR showed that the distribution of patients across the quartiles was significantly different between the OCT and angiography-guided groups (P=0.04; Figure 2B). 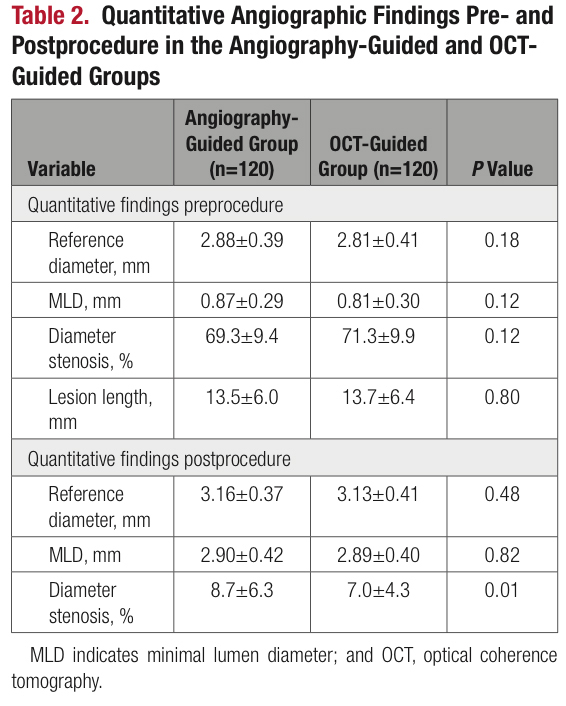 There were no significant differences in preprocedure quantitative angiographic findings between groups (Table 2). Approximately half the patients had B1-type lesions. OCT was successfully performed pre- and post-PCI in 100% of patients in the OCT-guided group. However, introduction of the OCT catheter downstream of the lesion resulted in subtotal occlusion of the artery in 32 patients (26.7%) in the OCT-guided group due to the severity of the stenosis or the presence of thrombus, and required predilation to enable an OCT run suitable for analysis. Quantitative findings as assessed by OCT are shown in Table 3, and qualitative OCT findings are detailed in Table I in the online-only Data Supplement . Thrombus and calcifications were observed significantly more frequently by OCT than by angiography alone (83 [69%] versus 56 [47%], P=0.0004; 55 [45.8%] versus 11 [9%], P<0.0001, respectively). Plaque rupture was present in half of all lesions and intact fibrous cap in the other half. Two-thirds had lipid-rich plaque composition, and one-third were composed of fibrous plaque. Presence of thin-cap fibroatheroma was observed in 70 patients (58.3%). There was no significant difference in procedural strategy between the 2 groups before stent implantation (Table 4), except for more frequent use of GP IIb/IIIa inhibitors in the OCT-guided group, due to the significantly higher rate of thrombus visualized by OCT. Otherwise, antiplatelet and anticoagulant therapy both prior to and during the procedure was similar in both groups (Table II in the online-only Data Supplement ). Although calcifications were more frequently observed in the OCT-guided group, this finding did not lead to any difference in procedural strategy between groups. The first OCT run performed immediately after stent implantation in the OCT-guided group revealed the existence of stent malapposition in 38 patients (32%) and stent underexpansion in 50 (42%) (Table 4). Post-stent overdilation was performed in all patients with stent underexpansion, and in 22 out of 38 patients (58%) with stent malapposition (of whom 20 also had stent underexpansion, only 2 had isolated malapposition). Overall, there was a greater rate of poststent overdilation in the OCT-guided group compared with the angiography-guided group. Edge dissection was observed more frequently in the OCT-guided group (45 [37.5%] versus 5 [4%], P<0.0001). Among the 45 edge dissec- tions observed in the OCT-guided group, 6 (5%) were visible by angiography alone. Additional stent implantation was performed in 32 patients in the OCT-guided group (24 for incomplete lesion coverage and 8 for adventitial edge dissection) and in 22 in the angiography-guided group (20 for incomplete lesion coverage and 2 for edge dissection). 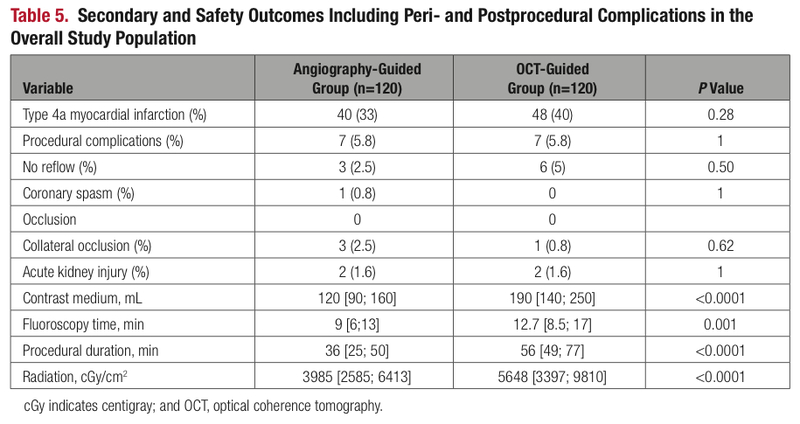 Overall, the use of OCT led the operator to optimize the procedural strategy in 60 patients (50%), compared with 27 patients (22.5%) in the angiography-guided group (P<0.0001), leading to a significantly lower diameter stenosis at the end of PCI (7.0±4.3% versus 8.7±6.3%, OCT versus angio, P=0.01; Table 2). There was a significant improvement in quantitative OCT data between the OCT run performed immediately after stent implantation, and the final OCT run performed after optimization, at the end of the procedure. Stent expansion increased from 78.9±12.4% immediately after stent implantation to 84.1±7.3% at the end of the procedure after optimization (P<0.0001; Figure 3). The average number of OCT runs overall was 3.8±1.4. Receiver operating characteristic curve analysis was used to compare the performance of the quantitative OCT parameters to predict FFR >0.90. The area under the curve was 0.79 (0.71–0.86; P<0.0001) for minimal lumen area, 0.77 (0.69–0.84; P<0.0001) for stent expansion, 0.72 (0.63–0.80; P=0.0002) for minimal lumen diameter, and 0.69 (0.60–0.77; P=0.003) for diameter stenosis (Figure II in the online-only Data Supplement ). Direct comparison of the area under the curve did not reveal any significant difference between these quantitative OCT parameters in terms of predictive capacity. The optimal cutoff value of minimal lumen area to predict FFR >0.90 was >5.44 mm2 with a sensitivity of 91.3% and specificity 60.2%, while the optimal cutoff value of stent expansion to predict FFR > 0.90 was >79.4%, with sensitivity of 83.7% and specificity 65.2%. There was no significant difference in the rate of procedural complications between groups (7 [5.8%] events in each group; Table 5). Similarly, the proportion of type 4a MI and AKI did not differ between groups. Conversely, the duration of OCT-guided procedures was significantly longer than in those guided by angiography alone, with a significantly greater fluoroscopy time. On average, the volume of contrast medium and the dose of radiation delivered were significantly greater in the OCT-guided group (P<0.0001 for each; Table 5). Discharge treatment was similar in both groups (Table II in the online-only Data Supplement ), with 100% prescription of P2Y12 inhibitors and 99% and 98% with aspirin at discharge in the angiography-guided and OCT-guided groups respectively. One patient (from the angiography- guided group) was lost to follow-up, but data from municipal death registries indicate that this patient was still alive at the study cut-off date. The rate of major adverse cardiac events was similar in both groups (Table IV in the online-only Data Supplement ). There was 1 death in the OCT-guided group, and 1 recurrent MI in each group, both unrelated to the target vessel. No stent thrombosis was observed during follow-up, and there was no significant difference in the rate of target vessel revascularization between groups. The DOCTORS trial is the first randomized, prospective, multicenter trial to investigate the use of OCT on top of angiographic guidance and to show that in patients with NSTE-ACS, OCT provided useful additional information beyond that obtained by angiography alone and was associated with better functional outcome as assessed by FFR. We took a pragmatic approach, choosing OCT variables that are easy to identify and measure, to guarantee that OCT guidance could be implemented easily in routine clinical practice. In this context, most of the definitions of variables and features were based on available expert consensus documents.12–14 The only quantitative criteria that had to be respected were the choice of the stent diameter and length according to OCT measurements, and the use of poststent overdilation in case of stent underexpansion. In addition, implantation of an additional stent was mandatory in case of incomplete lesion coverage with persistent significant stenosis. Otherwise, the use of other strategies to optimize PCI, such as rotational atherectomy, thromboaspiration or GP IIb/ IIIa inhibitors, was at the operator’s subjective discretion. Similarly, in the absence of established critical thresholds beyond which malapposition and tissue prolapse warrant intervention, the management of these findings also was left at the operator’s discretion. Our data suggest that the pre-PCI OCT run did not seem to affect procedural strategy, with the exception of greater use of GP IIb/IIIa inhibitors, in response to more frequent visualization of intracoronary thrombus. Presence and extent of calcification, plaque composition, and presence of plaque rupture or thin-cap fibro- atheroma did not influence physician decision-making. In the current state of knowledge, there are no data to justify the use of any particular procedural approach according to the composition of the plaque. Quantitative analysis of the lesion by OCT pre-PCI did not affect the choice of stent length or diameter compared with visual assessment by angiography alone. Furthermore, considering that in 26.7% of cases, predilation was required to obtain a first interpretable OCT run, the question arises as to the utility of using OCT prior to stent implantation. Conversely, the post-PCI prompted a change in procedural strategy in half of the patients in the OCT- guided group. This is somewhat different than the non- randomized ILUMIEN-I study, where it was reported that pre- and poststenting OCT changed the procedural strategy in 57% and 27% of cases, respectively.6 The improvement in FFR observed in the OCT-guided group in our study was related mainly to the correction of stent underexpansion identified by OCT. Indeed, the rate of underexpansion observed in our study (42%) was higher than previously reported registry data (24%5 and 35%),18 but almost identical to the rate reported in the ILUMIEN I study (41%).6 We found that stent expansion > 79.4% and final minimal lumen area > 5.44 mm2 were predictive of FFR value >0.90. In previous studies,5,18,19 stent underexpansion was asso- ciated with an increased risk of major adverse cardiac events during follow-up. Data from the CLI-OPCI registry (Centro per la Lotta contro l’Infarto-Optimisation of Percutaneous Coronary Intervention) suggest that the use of OCT could improve clinical outcomes in patients undergoing PCI. A significant reduction in the primary end point of cardiac death or myocardial infarction was observed in patients undergoing OCT-guided PCI compared with patients treated with angiographic guidance alone.4 The data from this registry established that suboptimal stent deployment was associated with an increased risk of major adverse cardiac events during follow-up.4,5,20 The findings of the DOCTORS study therefore strengthen the evidence in favor of a potential benefit of OCT to guide PCI in patients with ACS. The functional improvement observed in the group with OCT guidance could be a mechanism mediating the clinical benefit observed in CLI-OPCI. The prognostic impact of OCT findings other than stent underexpansion on FFR value is more difficult to establish. In terms of safety, the excess interventions prompted by OCT findings in 50% of the OCT-guided group was not accompanied by an increased risk of periprocedural type 4a MI. Conversely, the duration of the procedure was significantly longer in the OCT-guided group, with a greater dose of radiation delivered. Similarly, a significantly greater volume of contrast medium was administered in the OCT-guided group, although this did not engender a greater rate of acute kidney injury. Nonetheless, in view of the study design, it is likely that there is potential to reduce the number of OCT runs and the fluoroscopic time. This study suffers has limitations that deserve to be noted. Firstly, it was an open-label design, and thus, we cannot exclude the possibility that the knowledge of the study arm may have influenced the operator’s strategy. Nonetheless, to minimize potential bias, the study protocol was designed to direct physician strategy as far as possible, based on objective criteria recommended in consensus documents.12–14 Given that the reaction to qualitative OCT findings was at the operator’s discre- tion, we cannot exclude the possibility that results may vary with local practices. For instance, in the absence of specific recommendations, the management of stent malapposition was at the operator’s discretion. Thus, the impact of correction of stent malapposition cannot be ascertained. Secondly, the choice of a surrogate parameter as the primary end point is open to discus- sion. However, conducting a study on a clinical end point would require a substantial number of patients, although the ongoing randomized OPINION trial (Optical Frequency Domain Imaging vs. Intravascular Ultrasound in Percutaneous Coronary Intervention; ClinicalTrials. gov NCT01873027) aims to compare intravascular ul- trasound versus OCT guidance directly in terms of clinical outcomes after PCI with drug-eluting stent implantation. Furthermore, it has been established that there is a statistical association between FFR and outcome after PCI,17 in line with the recommendations for validating surrogate end points.29 Thirdly, we did not perform any economic evaluation in this study. The economic implications deserve to be evaluated, given the additional cost of OCT catheters, and the greater use of GP IIb/ IIIa inhibitors and contrast medium. Lastly, although the target lesion was a single lesion on the culprit artery without angiographically diffuse disease on the same vessel, we cannot exclude the possibility that residual disease burden may have affected the final FFR value. In patients with ACS, OCT guidance during PCI provided useful information beyond that obtained by angiography alone. The OCT findings affected physician decision-making directly, leading to a change in procedural strategy in half of cases in the OCT-guided group, and was associated with a higher FFR at the end of the procedure than PCI guided by fluoroscopy alone. This improvement was driven mainly by optimization of stent expansion. The benefit was obtained at the cost of a longer procedure with higher fluo- roscopy time and more contrast medium, but without an increase in periprocedural MI or kidney dysfunction. We thank Céline Tchaoussoff (University Hospital Jean Minjoz, Be- sancon, France) for data management and Marie-Line Perruche (University Hospital Jean Minjoz, Besancon, France) for screening. The DOCTORS (Does Optical Coherence Tomography Optimize Results of Stenting) study was funded by the French government’s national hospital research program (Program Hospitalier de Recherche Clinique 2013). N.M. declares consulting fees and speaker honoraria (modest) from St. Jude Medical, Bayer, Daiichi Sankyo, Astra Zeneca, BMS-Pfizer, and speaker honoraria from Boehringer Ingelheim. E.V.B. declares honoraria (modest) from St. Jude Medical and Philips/Volcano. P.M. declares consulting fees (modest) from Terumo and St. Jude Medical. G.S. declares consulting fees (modest) from Terumo and St. Jude Medical. N.A. declares consulting fees (modest) from St. Jude Medical. C.C. declares consulting fees (modest) from St. Jude Medical. J.S. declares Research Grants to Institution from Fondation de France; consulting fees (modest) from Actelion, Amed, Astra-Zeneca, Bayer, Sanofi-Aventis, Daiichi-Sankyo, and Eli Lilly; speaker honoraria (modest) from AstraZeneca, Algorythm, Amgen, Daiichi Sankyo, Eli Lilly, and Iroko Cardio. F.S. declares honoraria from Amgen, BMS-Pfizer, Merck, Eli-Lilly, Daiichi Sankyo, and Sanofi- Aventis. The other authors declare no conflicts. From Department of Cardiology, EA3920, University Hospital Jean Minjoz, Besançon, France (N.M., N.B., R.C., M.C., F.E., H.T., F.S. ); University Hospital Gabriel Montpied, and Université d’Auvergne UMR 6284, Clermont Ferrand, France (G.S., P.M.); Institut Mutualiste Montsouris, Paris, France (C.C., N.A. ); Nouvel Hôpital Civil, Strasbourg, France (P.O., O.M. ); Centre Hospitalier, Belfort, France (Y.L. ); Centre Hospitalier, Chambéry, France (V.D.-G.); Sorbonne Université – Univ Paris 06 (UPMC), ACTION Study Group, INSERM UMR-S 1166, ICAN, Institut de Cardiologie, Hôpital Pitié-Salpêtrière (AP-HP), Paris, France (J.S. ); Department of Cardiology, CHRU Lille and UMR1011, Lille, France (E.V.B. ); and Centre Hospitalier, An- necy, France (L.B.). Received July 8, 2016; accepted August 9, 2016. 1. Niccoli G, Montone RA, Di Vito L, Gramegna M, Refaat H, Scalone G, Leone AM, Trani C, Burzotta F, Porto I, Aurigemma C, Prati F, Crea F. Plaque rupture and intact fibrous cap assessed by optical coherence tomography portend different outcomes in patients with acute coronary syndrome. Eur Heart J. 2015;36:1377– 1384. doi: 10.1093/eurheartj/ehv029. 2. Vergallo R, Ren X, Yonetsu T, Kato K, Uemura S, Yu B, Jia H, Abta- hian F, Aguirre AD, Tian J, Hu S, Soeda T, Lee H, McNulty I, Park SJ, Jang Y, Prasad A, Lee S, Zhang S, Porto I, Biasucci LM, Crea F, Jang IK. Pancoronary plaque vulnerability in patients with acute coronary syndrome and ruptured culprit plaque: a 3-vessel optical coherence tomography study. Am Heart J. 2014;167:59–67. doi: 10.1016/j.ahj.2013.10.011. 3. Porto I, Di Vito L, Burzotta F, Niccoli G, Trani C, Leone AM, Bi- asucci LM, Vergallo R, Limbruno U, Crea F. Predictors of peri- procedural (type IVa) myocardial infarction, as assessed by frequency-domain optical coherence tomography. Circ Cardio- vasc Interv. 2012;5:89–96, S1. doi: 10.1161/CIRCINTERVEN- TIONS.111.965624. 4. Prati F, Di Vito L, Biondi-Zoccai G, Occhipinti M, La Manna A, Tamburino C, Burzotta F, Trani C, Porto I, Ramazzotti V, Imola F, Manzoli A, Materia L, Cremonesi A, Albertucci M. Angiography alone versus angiography plus optical coherence tomography to guide decision-making during percutaneous coronary intervention: the Centro per la Lotta contro l’Infarto-Optimisation of Percuta- neous Coronary Intervention (CLI-OPCI) study. EuroIntervention. 2012;8:823–829. doi: 10.4244/EIJV8I7A125. 5. Prati F, Romagnoli E, Burzotta F, Limbruno U, Gatto L, La Manna A, Versaci F, Marco V, Di Vito L, Imola F, Paoletti G, Trani C, Tambu- rino C, Tavazzi L, Mintz GS. Clinical impact of OCT findings during PCI: the CLI-OPCI II study. Cardiovasc Imaging. 2015;8:1297– 1305. doi: 10.1016/j.jcmg.2015.08.013. 6. Wijns W, Shite J, Jones MR, Lee SW, Price MJ, Fabbiocchi F, Barbato E, Akasaka T, Bezerra H, Holmes D. Optical coherence tomography imaging during percutaneous coronary intervention impacts physician decision-making: ILUMIEN I study. Eur Heart J. 2015;36:3346–3355. doi: 10.1093/eurheartj/ehv367. 7. Waksman R, Didier R. Intracoronary imaging: see more, better or worse? Eur Heart J. 2015;36:3356–3358. doi: 10.1093/eur- heartj/ehv433. 8. Sawlani NN, Bhatt DL. How to decipher OCT after PCI. Car- diovasc Imaging. 2015;8:1306–1308. doi: 10.1016/j. jcmg.2015.09.005. 9. 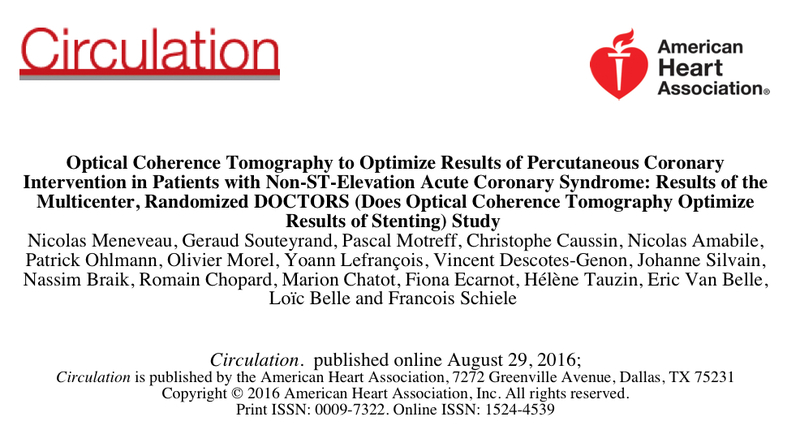 Meneveau N, Ecarnot F, Souteyrand G, Motreff P, Caussin C, Van Belle E, Ohlmann P, Morel O, Grentzinger A, Angioi M, Chopard R, Schiele F. Does optical coherence tomography optimize results of stenting? Rationale and study design. Am Heart J. 2014;168:175– 81.e1. doi: 10.1016/j.ahj.2014.05.007. 12. Prati F, Guagliumi G, Mintz GS, Costa M, Regar E, Akasaka T, Barlis P, Tearney GJ, Jang IK, Arbustini E, Bezerra HG, Ozaki Y, Bruining N, Dudek D, Radu M, Erglis A, Motreff P, Alfonso F, Toutouzas K, Gonzalo N, Tamburino C, Adriaenssens T, Pinto F, Serruys PW, Di Mario C; Expert’s OCT Review Document. Expert review document part 2: methodology, terminology and clinical applications of optical coherence tomography for the assessment of interventional procedures. Eur Heart J. 2012;33:2513–2520. doi: 10.1093/eurheartj/ehs095. 13. Prati F, Regar E, Mintz GS, Arbustini E, Di Mario C, Jang IK, Aka- saka T, Costa M, Guagliumi G, Grube E, Ozaki Y, Pinto F, Serruys PW; Expert’s OCT Review Document. Expert review document on methodology, terminology, and clinical applications of optical co- herence tomography: physical principles, methodology of image acquisition, and clinical application for assessment of coronary ar- teries and atherosclerosis. Eur Heart J. 2010;31:401–415. doi: 10.1093/eurheartj/ehp433. 14. Tearney GJ, Regar E, Akasaka T, Adriaenssens T, Barlis P, Bezerra HG, Bouma B, Bruining N, Cho JM, Chowdhary S, Costa MA, de Silva R, Dijkstra J, Di Mario C, Dudek D, Dudeck D, Falk E, Falk E, Feldman MD, Fitzgerald P, Garcia-Garcia HM, Garcia H, Gonzalo N, Granada JF, Guagliumi G, Holm NR, Honda Y, Ikeno F, Kawasaki M, Kochman J, Koltowski L, Kubo T, Kume T, Kyono H, Lam CC, Lamouche G, Lee DP, Leon MB, Maehara A, Manfrini O, Mintz GS, Mizuno K, Morel MA, Nadkarni S, Okura H, Otake H, Pietrasik A, Prati F, Räber L, Radu MD, Rieber J, Riga M, Rollins A, Rosenberg M, Sirbu V, Serruys PW, Shimada K, Shinke T, Shite J, Siegel E, So- noda S, Sonada S, Suter M, Takarada S, Tanaka A, Terashima M, Thim T, Troels T, Uemura S, Ughi GJ, van Beusekom HM, van der Steen AF, van Es GA, van Es GA, van Soest G, Virmani R, Waxman S, Weissman NJ, Weisz G; International Working Group for Intra- vascular Optical Coherence Tomography (IWG-IVOCT). Consensus standards for acquisition, measurement, and reporting of intra- vascular optical coherence tomography studies: a report from the International Working Group for Intravascular Optical Coherence Tomography Standardization and Validation. J Am Coll Cardiol. 2012;59:1058–1072. doi: 10.1016/j.jacc.2011.09.079. 15. Cutlip DE, Windecker S, Mehran R, Boam A, Cohen DJ, van Es GA, Steg PG, Morel MA, Mauri L, Vranckx P, McFadden E, Lan- sky A, Hamon M, Krucoff MW, Serruys PW; Academic Research Consortium. Clinical end points in coronary stent trials: a case for standardized definitions. Circulation. 2007;115:2344–2351. doi: 10.1161/CIRCULATIONAHA.106.685313. 16. DeLong ER, DeLong DM, Clarke-Pearson DL. Comparing the areas under two or more correlated receiver operating characteristic curves: a nonparametric approach. Biometrics. 1988;44:837–845. 17. Pijls NH, Klauss V, Siebert U, Powers E, Takazawa K, Fearon WF, Es- caned J, Tsurumi Y, Akasaka T, Samady H, De Bruyne B; Fractional Flow Reserve (FFR) Post-Stent Registry Investigators. Coronary pres- sure measurement after stenting predicts adverse events at follow- up: a multicenter registry. Circulation. 2002;105:2950–2954. 18. Soeda T, Uemura S, Park SJ, Jang Y, Lee S, Cho JM, Kim SJ, Vergallo R, Minami Y, Ong DS, Gao L, Lee H, Zhang S, Yu B, Saito Y, Jang IK. Incidence and clinical significance of poststent optical coherence tomography findings: one-year follow-up study from a multicenter registry. Circulation. 2015;132:1020–1029. doi: 10.1161/CIRCULATIONAHA.114.014704. 19. Prati F, Kodama T, Romagnoli E, Gatto L, Di Vito L, Ramazzotti V, Chisari A, Marco V, Cremonesi A, Parodi G, Albertucci M, Al- fonso F. Suboptimal stent deployment is associated with subacute stent thrombosis: optical coherence tomography insights from a multicenter matched study. From the CLI Foundation investiga- tors: the CLI-THRO study. Am Heart J. 2015;169:249–256. doi: 10.1016/j.ahj.2014.11.012. 20. Waksman R, Kitabata H, Prati F, Albertucci M, Mintz GS. Intravas- cular ultrasound versus optical coherence tomography guidance. J Am Coll Cardiol. 2013;62(17 Suppl):S32–S40. doi: 10.1016/j. jacc.2013.08.709. 21. Chamié D, Bezerra HG, Attizzani GF, Yamamoto H, Kanaya T, Stefano GT, Fujino Y, Mehanna E, Wang W, Abdul-Aziz A, Dias M, Simon DI, Costa MA. Incidence, predictors, morphological characteristics, and clinical outcomes of stent edge dissections detected by optical coherence tomography. Cardiovasc Interv. 2013;6:800–813. doi: 10.1016/j.jcin.2013.03.019. 22. Bezerra HG, Attizzani GF, Sirbu V, Musumeci G, Lortkipanidze N, Fujino Y, Wang W, Nakamura S, Erglis A, Guagliumi G, Costa MA. Optical coherence tomography versus intravascular ultrasound to evaluate coronary artery disease and percutaneous coronary in- tervention. Cardiovasc Interv. 2013;6:228–236. doi: 10.1016/j. jcin.2012.09.017. 23. Gogas BD, Garcia-Garcia HM, Onuma Y, Muramatsu T, Farooq V, Bourantas CV, Serruys PW. Edge vascular response after percu- taneous coronary intervention: an intracoronary ultrasound and optical coherence tomography appraisal: from radioactive plat- forms to first- and second-generation drug-eluting stents and bio- resorbable scaffolds. Cardiovasc Interv. 2013;6:211–221. doi: 10.1016/j.jcin.2013.01.132. 24. Souteyrand G, Amabile N, Mangin L, Chabin X, Meneveau N, Cayla G, Vanzetto G, Barnay P, Trouillet C, Rioufol G, Rangé G, Teiger E, Delaunay R, Dubreuil O, Lhermusier T, Mulliez A, Levesque S, Belle L, Caussin C, Motreff P; PESTO Investigators. Mechanisms of stent thrombosis analysed by optical coherence tomography: insights from the national PESTO French registry. Eur Heart J. 2016;37:1208–1216. doi: 10.1093/eurheartj/ ehv711. 25. Choi SY, Witzenbichler B, Maehara A, Lansky AJ, Guagliumi G, Brodie B, Kellett MA Jr, Dressler O, Parise H, Mehran R, Dan- gas GD, Mintz GS, Stone GW. Intravascular ultrasound findings of early stent thrombosis after primary percutaneous intervention in acute myocardial infarction: a Harmonizing Outcomes with Revas- cularization and Stents in Acute Myocardial Infarction (HORIZONS- AMI) substudy. Circ Cardiovasc Interv. 2011;4:239–247. doi: 10.1161/CIRCINTERVENTIONS.110.959791. 26. Magro M, Regar E, Gutiérrez-Chico JL, Garcia-Garcia H, Simsek C, Schultz C, Zijlstra F, Serruys PW, van Geuns RJ. Residual ath- erothrombotic material after stenting in acute myocardial infarc- tion–an optical coherence tomographic evaluation. Int J Cardiol. 2013;167:656–663. doi: 10.1016/j.ijcard.2012.03.073. 27. Im E, Kim BK, Ko YG, Shin DH, Kim JS, Choi D, Jang Y, Hong MK. 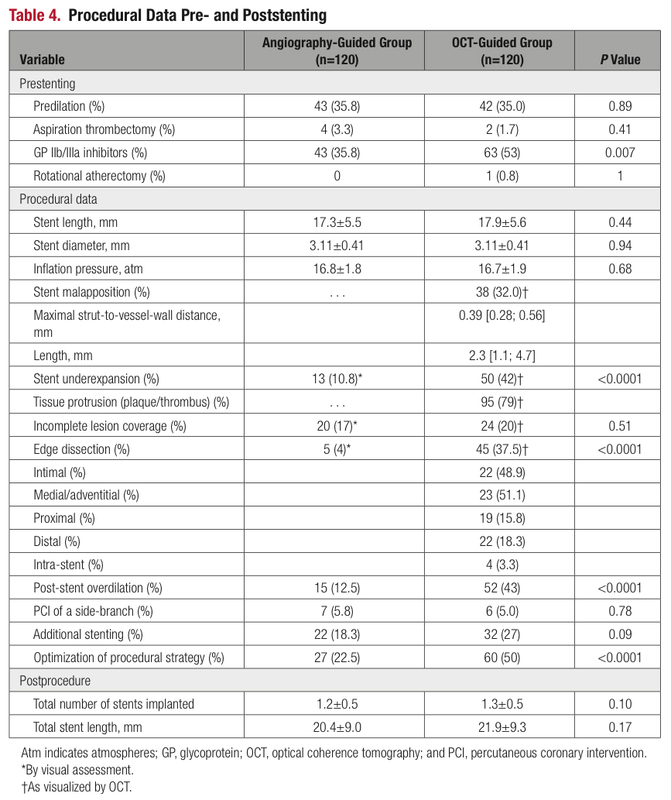 Incidences, predictors, and clinical outcomes of acute and late stent malapposition detected by optical coherence tomog- raphy after drug-eluting stent implantation. Circ Cardiovasc In- terv. 2014;7:88–96. doi: 10.1161/CIRCINTERVENTIONS.113. 000797. 28. Mori H, Joner M, Finn AV, Virmani R. Malapposition: is it a major cause of stent thrombosis? Eur Heart J. 2016;37:1217–1219. doi: 10.1093/eurheartj/ehw006. 29. Weintraub WS, Lüscher TF, Pocock S. The perils of surrogate endpoints. Eur Heart J. 2015;36:2212–2218. doi: 10.1093/eur- heartj/ehv164.